I planted my shrub about six years ago; it’s now about four feet tall and equally wide. My references tell me that in the wild, they’ll grow about twelve feet high and wide. The Ruby-Throated Hummingbirds that visit my yard every summer already love the flowers of this shrub. Imagine how ecstatic they’ll be when it attains its mature size. 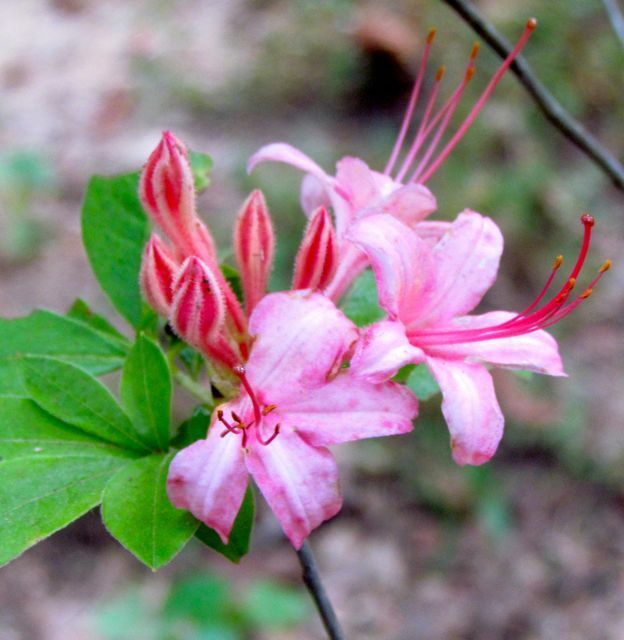 This azalea is native to a small region of southwest Georgia and eastern Alabama, where it occurs naturally on low, moist sites in Beech-Maple-Magnolia forests. The species is endangered in the wild because of habitat destruction. I figure that’s all the more reason to grow it in my yard, and I’ve sited it inside the deer fence on my north-facing slope near the bottom of the hill close to the creek. The soil is loamy, so the shrub’s roots don’t sit in water, but being at the bottom of the hill near the creek keeps that soil a bit more moist. Judging from its growth and flower production, I think I chose its site wisely. One other deciduous azalea surprised me with a few blossoms this week. It’s a naturally occurring hybrid between R. prunifolium and R. arborescens called Plum-Sweet. Rhododendron arborescens is called Sweet Azalea, because its white-to-pinkish flowers are knock-your-socks-off fragrant. 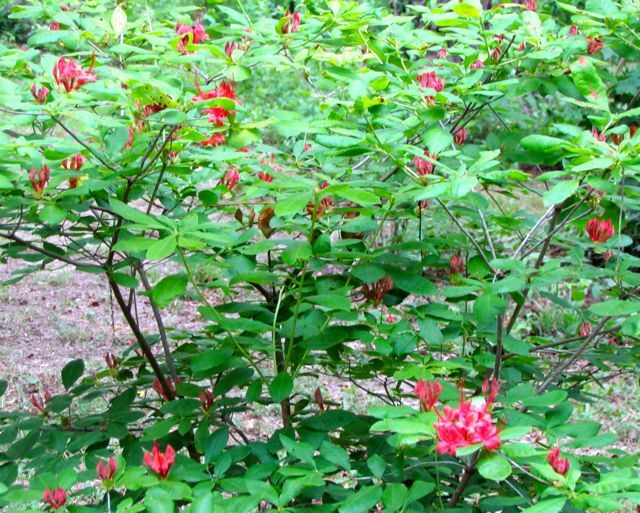 It likes moist sites and blooms this time of year too, and its natural distribution is much wider. I have one, but it’s outside the deer fence closer to the creek, which means it’s enclosed in a wire cage, and that has made it less enthusiastic about growing, much less blooming. 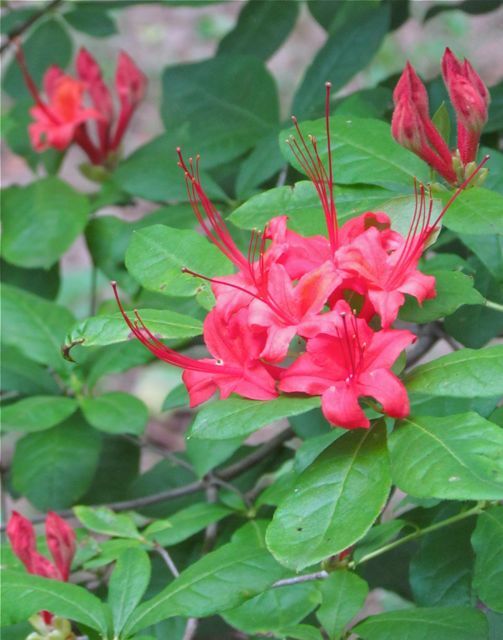 This fourth entry on my obsession with deciduous azaleas will be my last for this year. But when the bloom cycle starts again next spring, I expect you might see a mention or two about them again. Plus, there’s always the possibility that I’ll stumble across a new species or cultivar that I can’t live without. And a few of my current specimens still haven’t bloomed yet for me. Meanwhile, I’ll content myself with enjoying the red and pink blossoms of these late-bloomers. This entry was posted on June 16, 2011, 6:09 pm and is filed under Favorite Plants, piedmont gardening. You can follow any responses to this entry through RSS 2.0. You can leave a response, or trackback from your own site.